Born on the 6th of October 1959 to Mr. E.L. Clement and Mrs. Princet Clement, he had his schooling from Model School and St Josephs School, Trivadrum. He went on to complete B-Tech in Civil Engineering with distinction from the T. K.M. College of Engineering in 1983. He Joined the Govt sector in 1984 and after a brief stint with the Govt service, resigned his commission and started an Engineering, Architectural and Interior Design Consultancy firm called HOMETECH in Trivandrum. Hometech with its headquarters in Trivandrum, from its humble beginning in 1987 has grown into a leading consultancy organisation offering Architectural and Engineering Consultancy services for major firm and companies in Kerala and South India. He is currently also the Chairman of the Institute of Indian Interior Designer, Kerala Chapter. He was formerly its founder Secretary. He is also a past executive member of its National body. He is an executive member of the Chamber of Commerce, Trivandrum. He is a past tabler and a former Chairman of the Trivandrum Round table. He is a member of the Trivandrum Tennis Club and the Golf Club. 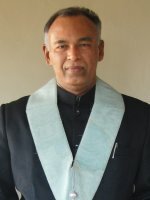 He was initiated in Lodge Trivandrum 168 in the year 1999. He is also a member of Lodge Travancore 329. He was awarded the Certificate of service to Masonry in 2006 for his involvement in the rehabilitation of the Tsunami victim housing and community hall projects for which he was the principle architect. He is a keen tennis player and a former university and state player. His interests are country music, cricket and movies. He married Jaikumari, daughter of Dr. N.D.Jeysekaran and Rani Jeysekaran, in the year 1985. She is a multi faceted personality, a home science graduate, who went on to complete hospital administration and later completed PG diploma in interior design. She manages Hometech and looks after the Interior Design division. They both are good hosts and love entertaining people in their house ‘Anurgaham’, at P.T.P Avenue, Trivandrum. They are blessed with 2 sons. Their elder son Ashwin, born on 23rd April 1987, is a Doctor of Medicine, currently working in Vellore. Their second son, Arvind, born on the 12th of March, 1991 is a Architectural student in Chennai Hindustan University.